It is important to start with definitions, as numbers is the name of the game. Middle class households in the US are those with an income that is two-thirds to double that of the U.S. median household income, after incomes have been adjusted for the household size. The income it takes to be middle income varies by household size, with smaller households requiring less to support the same lifestyle as larger households. 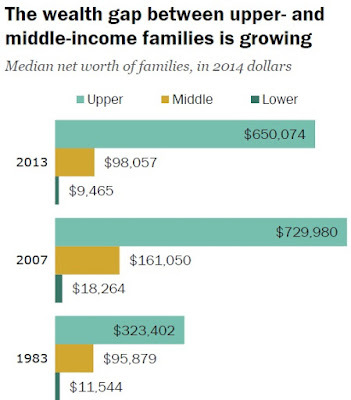 For a three-person household, the middle-income range was about $42,000 to $126,000 annually in 2014. However, a one-person household needed only about $24,000 to $73,000 to be middle income. For a five-person household to be considered middle income, its 2014 income had to range from $54,000 to $162,000. Education: There were no income status winners among educational attainment groups from 2001 to 2015, though the least educated adults (those with less than a high school diploma) and the most educated adults (those with at least a college degree) had the smallest losses. 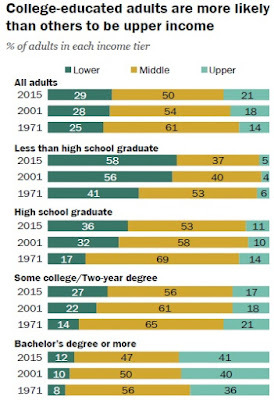 However, from 1971 to 2015, only one educational attainment group did not lose income status: college graduates. College educate adults are more likely than others to be upper income, however if in 1971 people with bachelor's degree or more combined represented 92% middle or upper class, in 2015 it is 88%. Degree is lesser guarantee of income in nowadays. What does it mean? In the practical terms, unless you came from extremely wealthy family it means that nobody is protected. The well paid manufacturing jobs are now shipped overseas. Give it another 20-40 years and with no change other well paid jobs will follow them, as it is very hard to be devoted from the real economy and be paid. For clarity: difference between "median" and "average" The median income refers to the income that is directly in the middle if you figuratively write down all the income in order from least to the greatest. So, in essence, no more than half the population has a greater (or lesser) income than the median income. 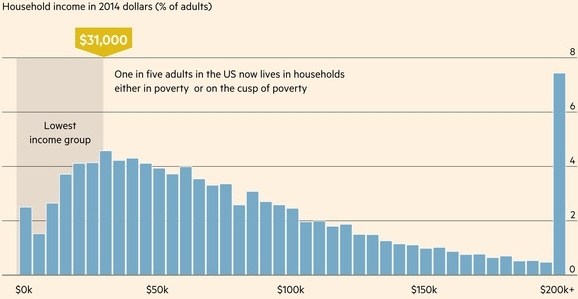 The average is simply adding all these incomes together and dividing by the number of incomes. Example: Here are 11 fictional home prices. The median price of these 11 homes is $105,000. Five homes were lower priced and five homes were higher priced. The average price of these 11 homes is $498,000. That's what you get if you add up all those prices and divide by 11.